Are you wondering what this year’s Annual End of Year musical will be? 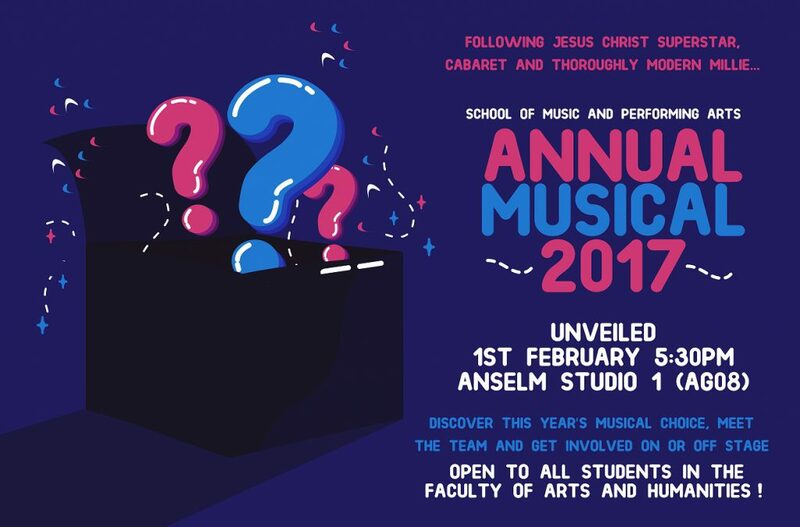 It’s that time of year again when we are prepared to unveil the choice for the MPA musical to be performed in June of the final term in 2017. The musical is always a real community effort and students have the opportunity to learn what its like to work together on a professional full-length show, which provides great experience both personally and for their CVs. In addition, as the sub-title suggests, the musical will no longer be open to only Music and Performing Arts students. Any students from within the Faculty of Arts and Humanities, including the School of Humanities, School of Languages and Linguistics and the School of Media, Art and Design are all eligible and welcome to audition/interview for any part. So please tell your friends and colleagues and come along to discover how you could get involved!